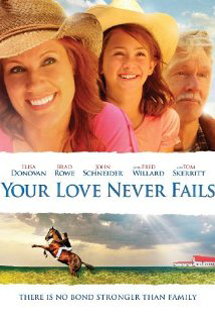 Review: Your Love Never Fails is the story of Laura (Elisa Donovan), a working mother who just wants to spend more time with her daughter Kelsey, 9. Unfortunately, her demanding boss Paul (Fred Willard) has other ideas. When Kelsey's father, Dylan (Brad Rowe) files for joint custody, Laura is forced to take Kelsey to Texas, where she confronts the lifestyle, church and father (Tom Skerritt) that she left behind. With the help of the local church Pastor, Frank (John Schneider), Laura and Dylan will find their way back to the commitment they made to each other and to Kelsey.